Democrats complained that committee members had not yet received the proper paperwork on DeVos from the Office of Government Ethics prior to the start of the hearing, and made every effort to protest to committee chairman Sen. Lamar Alexander (R-TN) that they should be permitted another round of questions. 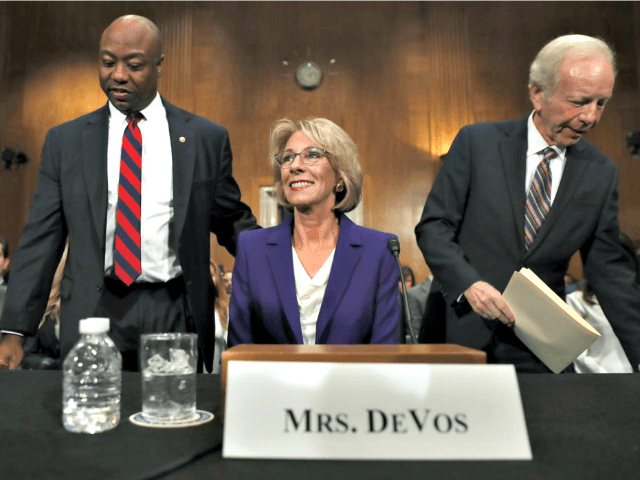 Democrats’ questions for DeVos, who was introduced by Sen. Tim Scott (R-SC) and former Sen. Joe Lieberman (I-CT), were largely intended to have her appear inexperienced and unqualified to serve as head of the federal education department. The senators portrayed her as an extremely wealthy woman who might be entangled in multiple ethical conflicts due to her massive portfolio and contributions to the campaigns of many of the Republicans on the HELP committee. Warren: Ms. DeVos, many of my Democratic colleagues have pointed out a lack of experience in K-12 public schools, but I’d like to ask you about your qualifications for leading the nation on higher education. The Department of Education is in charge of making sure that the $150 billion that we invest in students each year gets into the right hands, and that students have the support they need to be able to pay back their student loans. The Secretary of Education is essentially responsible for managing a trillion dollar student loan bank, and distributing $30 billion in Pell grants to students each year. The financial futures of an entire generation of young people depend on your department getting that right. Now, Mrs. DeVos, do you have any direct experience with running a bank? DeVos: Senator, I do not. Warren: Aha, have you ever managed or overseen a trillion dollar loan program? Warren: How about a billion dollar loan program? Warren: Okay! So, no experience managing a program like this! How about participating in one? I think it’s important for the person who is in charge of our financial aid programs to understand what it’s like for students and their families who are struggling to pay for college. Mrs. DeVos, have you ever taken out a student loan from the federal government to help pay for college? Warren: Have any of your children had to borrow money in order to go to college? DeVos: They have been fortunate not to. Warren: Aha, have you had any personal experience with the Pell grant? DeVos: Not personal experience, but certainly friends and, um, students with whom I’ve worked. Warren: So, you have no personal experience with college financial aid or management of higher education. Mrs. DeVos, let’s start with the basics. Do you support protecting federal taxpayer dollars from waste, fraud, and abuse? Warren: Oh, good. So do I. Because now we all know that President-elect Trump’s experience with higher education was to create a fake university, which resulted in his paying $25 million to students that he cheated. So, I’m curious about how the Trump administration would protect against waste, fraud, and abuse at similar for-profit colleges. So, here’s my question: how do you plan to protect taxpayer dollars from waste, fraud, and abuse by colleges that take in millions of dollars of federal student aid? Ranking member of the committee Sen. Patty Murray also asked DeVos if she would commit to not privatizing, or allowing taxpayer funding to “follow the child” from public schools to private and religious schools. DeVos responded by saying she would commit to addressing the needs of “all parents and students,” and added that some schools are not working for students. “I take that is not being willing to commit to not privatize public schools?” Murray asked. “I guess I would not characterize it in that way,” DeVos said. Establishment Republicans contend the ESSA law “repealed” the Common Core mandate, however, many experts on the law say it actually cements the hotly debated standards in the states. ESSA, which replaced No Child Left Behind, requires every state to submit its plan for standards for approval to the U.S. Department of Education. Often referring to herself as a “mom,” DeVos portrayed herself during questioning as a “sensitive,” concerned education reformer who wants only what’s best for parents and children. 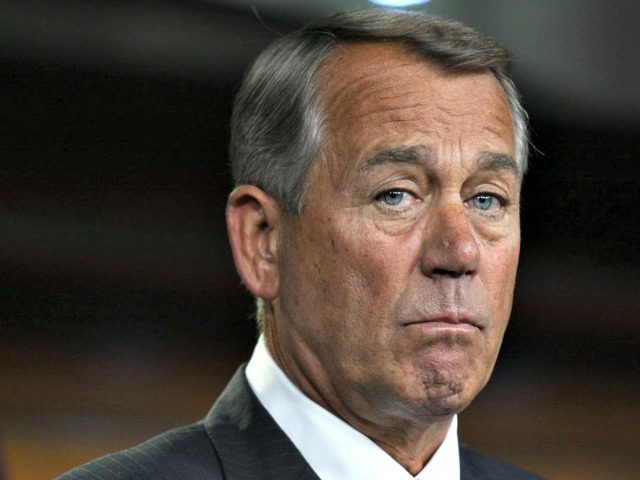 Former House Speaker John Boehner is endorsing Betsy DeVos as the next federal education department secretary. The former speaker says he has known DeVos for “more than 20 years,” and that she was “instrumental during my years working with legislators of both parties to establish and defend” the D.C. Opportunity Scholarship Program (DCOSP), a school choice program in Washington, D.C.
DCOSP was condemned by supporters of teachers unions who feared school choice legislation would deprive public schools of their federal funding. “A champion for education reform, Betsy DeVos stood with us every step of the way, working side by side with me and many other proponents of equal opportunity in education to ensure the program continued,” Boehner writes. "She knows that in order to ensure the next generation of Americans can compete and lead the world, we have to have an education system in which doors are open to continual improvement. And she has applied that knowledge with courage and conviction for years, personally leading major education reform initiatives in support of charter schools, school choice and other innovations that have opened new doors for students in her native Michigan and throughout the country." Former Sen. Lieberman Says DeVos Is "Ready To Take On This Assignment And Do It Very Well"
Sen Alexander Backs DeVos Nomination For Education Secretary She "Is On Our Children’s Side"
Sen. Burr Thanks DeVos For Her Commitment To Education And "For All The Kids Who Have Been Impacted"